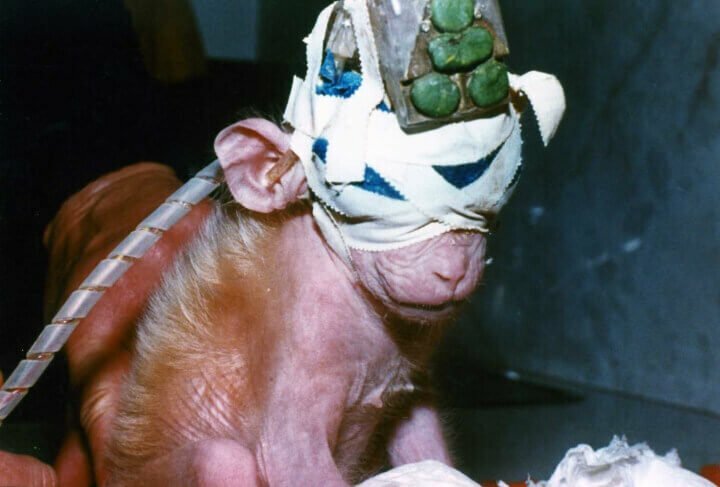 Animal testing, also known as animal experimentation, animal research and in vivo testing, is the use of non-human animals in experiments that seek to control the variables that affect the behavior or biological system under study. Each year, more than 100 million animals—including mice, rats, frogs, dogs, cats, rabbits, hamsters, guinea pigs, monkeys, fish, and birds—are killed in U.S. laboratories for biology lessons, medical training, curiosity-driven experimentation, and chemical, drug, food, and cosmetics testing. Before their deaths, some are forced to inhale toxic fumes, others are immobilized in restraint devices for hours, some have holes drilled into their skulls, and others have their skin burned off or their spinal cords crushed. In addition to the torment of the actual experiments, animals in laboratories are deprived of everything that is natural and important to them—they are confined to barren cages, socially isolated, and psychologically traumatized. The thinking, feeling animals who are used in experiments are treated like nothing more than disposable laboratory equipment. Pew Research Center poll have found that 50 percent of U.S. adults oppose the use of animals in scientific research, and other surveys suggest that the shrinking group that does accept animal experimentation does so only because it believes it to be necessary for medical progress. (1,2) The reality is that the majority of animal experiments do not contribute to improving human health, and the value of the role that animal experimentation plays in most medical advances is questionable. Diseases that are artificially induced in animals in a laboratory, whether they be mice or monkeys, are never identical to those that occur naturally in human beings. And because animal species differ from one another biologically in many significant ways, it becomes even more unlikely that animal experiments will yield results that will be correctly interpreted and applied to the human condition in a meaningful way. Research published in the journal Annals of Internal Medicine revealed that universities commonly exaggerate findings from animal experiments conducted in their laboratories and “often promote research that has uncertain relevance to human health and do not provide key facts or acknowledge important limitations.”(9) One study of media coverage of scientific meetings concluded that news stories often omit crucial information and that “the public may be misled about the validity and relevance of the science presented.”(10) Because experimenters rarely publish results of failed animal studies, other scientists and the public do not have ready access to information on the ineffectiveness of animal experimentation. Through their taxes, charitable donations, and purchases of lottery tickets and consumer products, members of the public are ultimately the ones who—knowingly or unknowingly—fund animal experimentation. One of the largest sources of funding comes from publicly funded government granting agencies such as NIH. Approximately 47 percent of NIH-funded research involves experimentation on nonhuman animals, and in 2012, NIH budgeted nearly $30 billion for research and development. (11,12) In addition, many charities––including the March of Dimes, the American Cancer Society, and countless others—use donations to fund experiments on animals. One-third of the projects funded by the National Multiple Sclerosis Society involve animal experimentation. (13) Visit HumaneSeal.org to find out which charities do and which do not fund research on animals. Research co-authored by PETA documented that, on average, animal experimenters and laboratory veterinarians comprise a combined 82 percent of the membership of IACUCs at leading U.S. institutions. A whopping 98.6 percent of the leadership of these IACUCs was also made up of animal experimenters. The authors observed that the dominant role played by animal experimenters on these committees “may dilute input from the few IACUC members representing animal welfare and the general public, contribute to previously-documented committee bias in favor of approving animal experiments and reduce the overall objectivity and effectiveness of the oversight system.”(23) Even when facilities are fully compliant with the law, animals who are covered can be burned, shocked, poisoned, isolated, starved, forcibly restrained, addicted to drugs, and brain-damaged. No procedures or experiments, regardless of how trivial or painful they may be, are prohibited by federal law. When valid non-animal research methods are available, no federal law requires experimenters to use such methods instead of animals. Research with human volunteers, sophisticated computational methods, and in vitro studies based on human cells and tissues are critical to the advancement of medicine. Cutting-edge non-animal research methods are available and have been shown time and again to be more accurate than crude animal experiments. (25) However, this modern research requires a different outlook, one that is creative and compassionate and embraces the underlying philosophy of ethical science. Human health and well-being can also be promoted by adopting nonviolent methods of scientific investigation and concentrating on the prevention of disease before it occurs, through lifestyle modification and the prevention of further environmental pollution and degradation. The public is becoming more aware and more vocal about the cruelty and inadequacy of the current research system and is demanding that tax dollars and charitable donations not be used to fund experiments on animals. 1) Cary Funk and Lee Rainie, “Public and Scientists’ Views on Science and Society,” Pew Research Center, 29 Jan. 2015. 2) Peter Aldhous and Andy Coghlan, “Let the People Speak,” New Scientist 22 May 1999. 3) Daniel G. Hackam, M.D., and Donald A. Redelmeier, M.D., “Translation of Research Evidence From Animals to Human,” The Journal of the American Medical Association 296 (2006): 1731-2. 4) Marlene Simmons et al., “Cancer-Cure Story Raises New Questions,” Los Angeles Times 6 May 1998. 5) Rich McManus, “Ex-Director Zerhouni Surveys Value of NIH Research,” NIH Record 21 June 2013. 6) Jarrod Bailey, “An Assessment of the Role of Chimpanzees in AIDS Vaccine Research,” Alternatives to Laboratory Animals 36 (2008): 381-428. 7) Steve Connor and Chris Green, “Is It Time to Give Up the Search for an AIDS Vaccine?” The Independent 24 Apr. 2008. 8) U.S. Food and Drug Administration, “FDA Issues Advice to Make Earliest Stages of Clinical Drug Development More Efficient,” FDA News Release 12 Jan. 2006. 9) Steve Woloshin, M.D., M.S., et al., “Press Releases by Academic Medical Centers: Not So Academic?” Annals of Internal Medicine 150 (2009): 613-8. 10) Steven Woloshin and Lisa Schwartz, “Media Reporting on Research Presented at Scientific Meetings: More Caution Needed,” The Medical Journal of Australia 184 (2006): 576-80. 11) Diana E. Pankevich et al., “International Animal Research Regulations: Impact on Neuroscience Research,” The National Academies (2012). 12) National Institutes of Health, “NIH Budget,” About NIH, 18 Nov. 2012. 14) Deborah Ziff, “On Campus: PETA Sues UW Over Access to Research Records,” Wisconsin State Journal 5 Apr. 2010. 15) U.S. Department of Agriculture, Animal and Plant Health Inspection Service, “Animal Welfare, Definition of Animal,” Federal Register, 69 (2004): 31513-4. 16) Justin Goodman et al., “Trends in Animal Use at US Research Facilities,” Journal of Medical Ethics 0(2015): 1-3. 17) The Associated Press, “Animal Welfare Act May Not Protect All Critters,” 7 May 2002. 19) U.S. Department of Agriculture, Office of Inspector General, “APHIS Animal Care Program, Inspection and Enforcement Activities,” audit report, 30 Sept. 2005. 20) U.S. Department of Agriculture, Animal and Plant Health Inspection Service, “USDA Employee Survey on the Effectiveness of IACUC Regulations,” Apr. 2000. 21) U.S. Department of Agriculture, Office of Inspector General, “APHIS Animal Care Program, Inspection and Enforcement Activities,” audit report, 30 Sept. 2005. 22) U.S. Department of Agriculture, Office of Inspector General, “Animal and Plant Health Inspection Service Oversight of Research Facilities,” audit report, Dec. 2014. 23) Lawrence A. Hansen et al., “Analysis of Animal Research Ethics Committee Membership at American Institutions,” Animals 2 (2012): 68-75. 24) Pandora Pound and Michael Bracken, “Is Animal Research Sufficiently Evidence Based To Be A Cornerstone of Biomedical Research?,” BMJ (2014): 348. 25) Junhee Seok et al., “Genomic Responses in Mouse Models Poorly Mimic Human Inflammatory Diseases,” Proceedings of the National Academy of Sciences 110 (2013): 3507-12. Up to 90% of animals used in U.S. labs are not counted in the official statistics of animals tested. The fact is that we already do test new drugs on people. No matter how many tests on animals are undertaken, someone will always be the first human to be tested on. 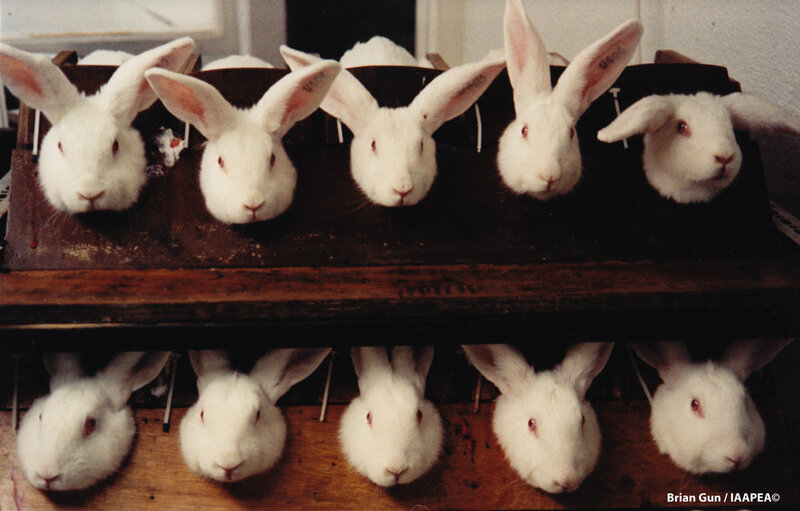 Because animal tests are so unreliable, they make those human trials all the more risky. The National Institutes of Health (NIH) has noted that 95 percent of all drugs that are shown to be safe and effective in animal tests fail in human trials because they don’t work or are dangerous. And of the small percentage of drugs approved for human use, half end up being relabeled because of side effects that were not identified in tests on animals. Vioxx, Phenactin, E-Ferol, Oraflex, Zomax, Suprol, Selacryn, and many other drugs have had to be pulled from the market in recent years because of adverse reactions experienced by people taking them. Despite rigorous animal tests, prescription drugs kill 100,000 people each year, making them our nation’s fourth-largest killer. Fortunately, a wealth of cutting-edge non-animal research methods promises a brighter future for both animal and human health. Taking healthy beings from a completely different species, artificially inducing a condition that they would never normally contract, keeping them in an unnatural and stressful environment, and trying to apply the results to naturally occurring diseases in human beings is dubious at best. Physiological reactions to drugs vary enormously from species to species (and even within a species). Penicillin kills guinea pigs but is inactive in rabbits. Aspirin kills cats and causes birth defects in rats, mice, guinea pigs, dogs, and monkeys. And morphine, a depressant in humans, stimulates goats, cats, and horses. 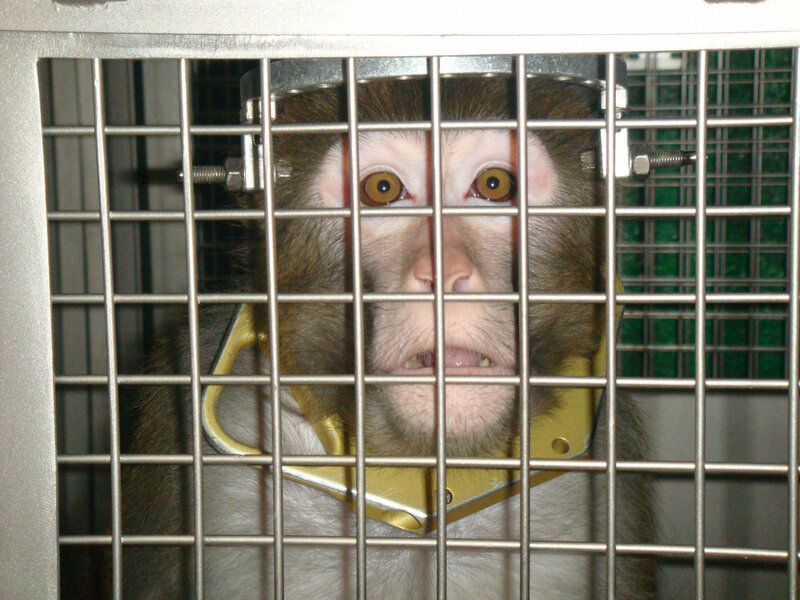 Further, animals in laboratories typically display behavior indicating extreme psychological distress, and experimenters acknowledge that the use of these stressed-out animals jeopardizes the validity of the data produced. Sir Alexander Fleming, who discovered penicillin, remarked, “How fortunate we didn’t have these animal tests in the 1940s, for penicillin would probably have never been granted a license, and probably the whole field of antibiotics might never have been realized.” Modern non-animal research methods are faster, cheaper, and more relevant to humans than tests on animals. Sophisticated human cell- and tissue-based research methods allow researchers to test the safety and effectiveness of new drugs, vaccines, and chemical compounds. The HμREL biochip uses living human cells to detect the effects of a drug or chemical on multiple interacting organs, VaxDesign’s Modular Immune in vitro Construct (MIMIC®) system uses human cells to create a working dime-sized human immune system for testing vaccines, and Harvard researchers have developed a human tissue-based “lung-on-a-chip” that can “breathe” and be used to estimate the effects of inhaled chemicals on the human respiratory system. Human tissue-based methods are also used to test the potential toxicity of chemicals and for research into burns, allergies, asthma, and cancer. Clinical research on humans also gives great insights into the effects of drugs and how the human body works. A research method called microdosing can provide information on the safety of an experimental drug and how it’s metabolized in the body by administering an extremely small one-time dose that’s well below the threshold necessary for any potential pharmacologic effect to take place. Researchers can study the working human brain using advanced imaging techniques and can even take measurements down to a single neuron. Through taxes, donations, and private funding, Americans have spent hundreds of billions of dollars on cancer research since 1971. However, the return on that investment has been dismal. A survey of 4,451 experimental cancer drugs developed between 2003 and 2011 found that more than 93 percent failed after entering the first phase of human clinical trials, even though all had been tested successfully on animals. The authors of this study point out that animal “models” of human cancer created through techniques such as grafting human tumors onto mice can be poor predictors of how a drug will work in humans. Richard Klausner, former head of the National Cancer Institute (NCI), has observed, “The history of cancer research has been a history of curing cancer in the mouse. We have cured mice of cancer for decades and it simply didn’t work in humans.” Studies have found that the chemicals that cause cancer in rats only caused cancer in mice 46 percent of the time. If extrapolating from rats to mice is so problematic, how can we extrapolate results from mice, rats, guinea pigs, rabbits, cats, dogs, monkeys, and other animals to humans? The NCI now uses human cancer cells, taken by biopsy during surgery, to perform first-stage testing for new anti-cancer drugs, sparing the 1 million mice the agency previously used annually and giving us all a much better shot at combating cancer. Furthermore, according to the World Health Organization, cancer is largely preventable, yet most health organizations that focus on cancer spend a pittance on prevention programs, such as public education. Epidemiological and clinical studies have determined that most cancers are caused by smoking and by eating high-fat foods, foods high in animal protein, and foods containing artificial colors and other harmful additives. We can beat cancer by taking these human-derived, human-relevant data into account and implementing creative methods to encourage healthier lifestyle choices. While incidences of heart disease and strokes have recently shown slight declines—because of a change in lifestyle factors, such as diet and smoking, rather than any medical advances—cancer rates continue to rise, and alcohol- and drug-treatment centers, prenatal care programs, community mental health clinics, and trauma units continue to close because they lack sufficient funds. More human lives could be saved and more suffering prevented by educating people about the importance of avoiding fat and cholesterol, quitting smoking, reducing alcohol and other drug consumption, exercising regularly, and cleaning up the environment than by all the animal tests in the world. The only U.S. law that governs the use of animals in laboratories, the Animal Welfare Act (AWA), allows animals to be burned, shocked, poisoned, isolated, starved, forcibly restrained, addicted to drugs, and brain-damaged. No experiment, no matter how painful or trivial, is prohibited—and painkillers are not even required. Even when alternatives to the use of animals are available, U.S. law does not require that they be used—and often they aren’t. Because the AWA specifically excludes rats, mice, birds, and cold-blooded animals, more than 95 percent of the animals used in laboratories are not even covered by the minimal protection provided by federal laws. Because they aren’t protected, experimenters don’t even have to provide them with pain relief. Between 2010 and 2014, nearly half a million animals—excluding mice, rats, birds, and cold-blooded animals—were subjected to painful experiments and not provided with pain relief. A 2009 survey by researchers at Newcastle University found that mice and rats who underwent painful, invasive procedures, such as skull surgeries, burn experiments, and spinal surgeries, were provided with post-procedural pain relief only about 20 percent of the time. In addition to the actual pain of experiments, a comprehensive view of the situation for animals in laboratories should take into account the totality of the suffering imposed on them, including the stress of capture, transportation, and handling; the extreme confinement and unnatural living conditions; the deprivation that constitutes standard husbandry procedures; and the physical and psychological stress experienced by animals used for breeding, who endure repeated pregnancies, only to have their young torn away from them, sometimes immediately after birth. Animals in laboratories endure lives of deprivation, isolation, stress, trauma, and depression even before they are enrolled in any sort of protocol. This fact is especially apparent when one considers the specialized needs of each species. In nature, many primates, including rhesus macaques and baboons, stay for many years or their entire lives with their families and troops. They spend hours together every day, grooming each other, foraging, playing, and making nests to sleep in each night. But in laboratories, primates are often caged alone. Laboratories often do not allow social interactions, provide family groups or companions, or offer grooming possibilities, nests, or surfaces softer than metal. Indeed, in many laboratories, animals are handled roughly—even for routine monitoring procedures that fall outside the realm of an experimental protocol—and this only heightens their fear and stress. Video footage from inside laboratories shows that many animals cower in fear every time someone walks by their cage. A 2004 article in Nature magazine indicated that mice housed in standard laboratory cages suffer from “impaired brain development, abnormal repetitive behaviors (stereotypies) and an anxious behavioral profile.” This appalling level of suffering results simply from standard housing conditions—before any sort of procedure is implemented. A November 2004 article in Contemporary Topics in Laboratory Animal Science examined 80 published papers and concluded that “significant fear, stress, and possibly distress are predictable consequences of routine laboratory procedures” including seemingly benign practices such as blood collection and handling. The most significant trend in modern research is the recognition that animals rarely serve as good models for the human body. Human clinical and epidemiological studies, human tissue- and cell-based research methods, cadavers, sophisticated high-fidelity human-patient simulators, and computational models have the potential to be more reliable, more precise, less expensive, and more humane alternatives to experiments on animals. Advanced microchips that use real human cells and tissues to construct fully functioning postage stamp–size organs allow researchers to study diseases and also develop and test new drugs to treat them. Progressive scientists have used human brain cells to develop a model “microbrain,” which can be used to study tumors, as well as artificial skin and bone marrow. We can now test skin irritation using reconstructed human tissues (e.g., MatTek’s EpiDermTM), produce and test vaccines using human tissues, and perform pregnancy tests using blood samples instead of killing rabbits. Experimentation using animals persists not because it’s the best science but because of archaic habits, resistance to change, and a lack of outreach and education. If experimenting on one intellectually disabled person could benefit 1,000 children, would we do it? Of course not! Ethics dictate that the value of each life in and of itself cannot be superseded by its potential value to anyone else. Additionally, money wasted on experiments on animals is money that could instead be helping people, through the use of modern, human-relevant non-animal tests. Experimenters claim a “right” to inflict pain on animals based on any number of arbitrary physical and cognitive characteristics, such as animals’ supposed lack of reason. But if lack of reason truly justified animal experimentation, experimenting on human beings with “inferior” mental capabilities, such as infants and the intellectually disabled, would also be acceptable. The argument also ignores the reasoning ability of many animals, including pigs who demonstrate measurably sophisticated approaches to solving problems and primates who not only use tools but also teach their offspring how to use them. The experimenters’ real argument is “might makes right.” They believe it’s acceptable to harm animals because they are weaker, because they look different, and because their pain is less important than human pain. This is not only cruel but also unethical. 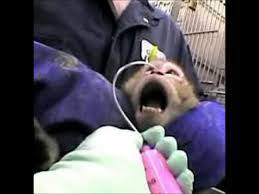 Tell Research-Funding Agencies to Kick Their Animal Experimentation Habit! 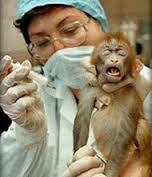 Animal experimentation is an inherently unethical practice, and you do not want your tax dollars used to support it. Funding for biomedical research should be redirected into the use of epidemiological, clinical, in vitro, and computer-modeling studies instead of cruel and crude experiments on animals. An idea with as many holes in it as that of using animals for human medical research requires ceaseless vigilance to keep afloat. Realizing this, one of the largest lab animal-breeding facilities in the world, Charles River Laboratories, formed the Association of Biomedical Research to lobby for animal experimenters in 1979. The multinational optics manufacturer, Bausch and Lomb, who purchased Charles River Laboratories in 1984, now controls the lobbying group. (A July 26, 1999 press release stated that Bausch and Lomb was selling Charles River to Global Health Care Partners.) In 1985, the Association of Biomedical Research pooled resources and merged with the National Society of Medical Research, an organization formed after World War II to promote the animal model. This union resulted in a leviathan political lobbying organization, the National Association of Biomedical Research (NABR), complete with an educational arm called the Foundation for Biomedical Research. NABR claims over 500 members, all corporations and organizations using lab animals, with annual dues ranging from $500 to $12,000. The president of NABR, Frankie Trull, also works independently as a lobbyist, through Policy Directions Inc., for several companies that sell or use lab animals. These include Charles River Laboratories, Athena Neurosciences, Carnation Nutritional products, Gynecare Inc., and the State University of New York at Albany. NABR newsletters feature stories about how to controvert the facts we present in this book. Truth is not on their agenda; money is.